3 gun competitions are becoming more and more popular. They require a lot of speed, accuracy, and efficiency. 3 gun competitions involve using three different guns at different stages with varying targets and distances. Finding the best 3 gun scope will help you perform your best during these competitions. 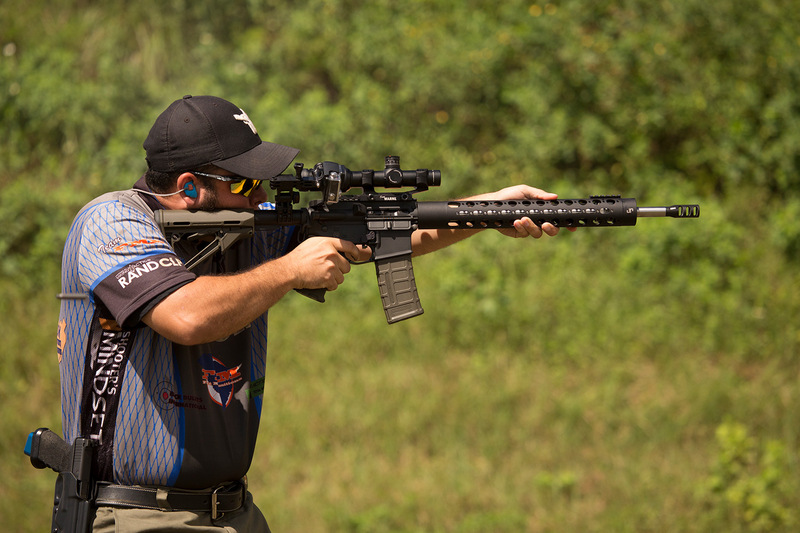 We’ve created a list of the top scopes for 3 gun competitions to help make sure you have the perfect equipment to help you succeed. Before you decide on a 3 gun scope there are certain things you’ll need to consider. Because 3 gun competitions have a lot of variety, you need a scope that will be flexible and work well in all kinds of situations. 3 gun competitions involve mid-range and close-range targets, sometimes at a distance of up to 500 yards. Because of that, you’ll need a scope with an adjustable magnification range. You need to be prepared for anything because you never know what the course layout will be like. Most 3 gun shooters choose scopes with low-power magnification because high magnification can be distorting when trying to shoot fast. Usually, the best scope to go with has a 1X magnification, which causes no distortion and no actual magnification. Looking through the scope should be identical to looking with plain eyes. Having a scope that is adjustable between 1-8X scope is ideal because it will allow you to see close targets normally and magnify targets that are farther away. Deciding between first-focal-plane and second-focal-plane may be a personal choice but there are a few things to keep in mind. With first-focal-plane, the reticle becomes enlarged as you increase magnification. With second-focal-plane however, the reticle stays the same size at all magnifications. Most long-distance shooters prefer first-focal-plane scopes but many 3 gun competitors complain that the reticle covers too much of the target when magnified. So most of them choose second-focal-plane scopes. Having an illuminated dot aid at the center of your scope can be very helpful during 3 gun competitions. It helps to draw your eye to the center and is easy to see in any light condition. Having this aid will help you shoot more accurately and quickly. Also, illuminated reticles help you clearly see the target in all kinds of lighting situations. Whether you’re shooting in dark or daytime conditions, you want to make sure you can see every target clearly during the competition. The eye box refers to the space that you can move your head around and still see through the scope. Some scopes require you to be perfectly aligned with the center of the lens to be able to see through it. This can slow you down during a 3 gun competition where you don’t always have the time to line up perfectly before making the shot. Having a larger eye box will allow you to see through the scope quickly and at different angles to help you get the perfect shot faster. Along with the eye box, you'll want to consider eye relief as well. This is the distance that your eye has to be from the lens for you to be able to see a full image through the scope. If your scope has a short eye relief, you'll have to be very close to the lens to see anything. However, with a longer eye relief, you can easily see through the lens at a further distance. This is helpful because you can start to see your target sooner when you look through the lens. This will help you find and shoot your target quicker and more accurately, which will help immensely in a 3 gun competition. This is another great scope from Vortex but is more advanced than the Crossfire. For experienced 3 gun shooters who want to have a variety in magnification, this scope does it all. It has 1-6x magnification, high image quality, and 11 different illumination levels to help you clearly see the reticle in all kinds of lights and situations. The versatility of this scope is one of the reasons it’s the best 3 gun scope. It will allow you to see your target clearly and brightly in any lighting situation, and it gives you great magnification options as well. Switching between the 1x and 6x magnification is easy, so you won’t waste time between targets. It’s a very powerful and versatile scope that will allow you to hit your mark no matter what situation you’re thrown into. It easily can handle close-range targets as well as long-distance targets. As with all Vortex products, it comes with a lifetime warranty so you know you're getting a great product. This scope from Bushnell is an excellent, high-performance optic device that will help you shoot accurately and quickly making it perfect for 3 gun. It features 1-8.5x magnification allowing you to adjust it for every situation that you may encounter in a competition. It has a sleek design and illuminated first-focal-plane reticle to help you easily see your target. This is a great choice for more experienced shooters who want a top quality scope and are willing to pay for more value. And it also comes with a lifetime warranty. Weaver Tactical delivers a high-value scope with this model. It gives you true 1x magnification at the lowest setting all the way up to 5x. It’s great for shooting mid- to close-range targets. It also has an illuminated first-focal-plane reticle that allows you to quickly spot and shoot your target. It’s one of the best 3 gun scopes because it gives you flexibility and helps you shoot targets at a variety of ranges. It’s designed to help you get very accurate, precise shots which is exactly what you need in a 3 gun competition. You'll be able to easily spot and center in on every target so that you get accurate its to maximize your performance in the competition. It also comes with a lifetime warranty, so you know it’s a great product. This is a great scope for 3 gun competitions because it's affordable, has 1x magnification that won't distort your sight, and an illuminated reticle. Vortex is a well-known name in the scope and rifle industry, they consistently deliver quality products and that's definitely the case with this scope. Although it may be simpler than other models on the list, this is perfect for anyone just starting out in 3 gun and needs a reliable scope. With it’s true 1x magnification, you’ll be able to clearly see your target at any distance and don’t have to worry about the image distorting, which could throw you off and cause you to mess up in the competition. The only downside is that this scope doesn't have focal plane adjustments, but for beginners, that's not a major issue. Plus, Vortex offers a lifetime warranty so you don't have to worry about anything. This scope from Kahles has 1-6x magnification and an illuminated second-focal-plane reticle, which is preferred by many 3 gun competitors. It also is fog proof and waterproof allowing you to maintain high performance in all kinds of weather conditions. It is a very powerful and well-made scope, made out of durable, high-quality materials. It is built to last, so you can put it through the test in your 3 gun competitions and this scope will handle it well. It's got great sight acquisition, is suitable for left or right-hand shooters and allows you to easily engage multiple targets. The only downside of this scope is that it's considerably more expensive than other models. But it does come with a lifetime warranty so you can feel comfortable knowing you’re getting a high-quality piece of equipment. This scope offers multi-coated lenses to provide excellent clarity and no distortion when looking through them. It has a magnification power of 1-6x, making it useful in all kinds of shooting scenarios. The illuminated second-focal-plane reticle is ideal for quickly centering your gun and shooting your target. It automatically adjusts the brightness level depending on the light conditions so you don’t have to do a thing. The illumination is battery-free as well and is powered by fiber optics. It produces a crystal-clear image that is perfectly illuminated every time. So you'll easily be able to find your target and get an accurate shot with this scope. This is definitely one of the best 3 gun scopes on the market that offers a lot of value and is more reasonably priced than others. Trijicon also offers a lifetime warranty to its customers which is an awesome bonus. The Bushnell AR scope features 14x magnification, a fast-focus eyepiece, and high-quality design for maximum accuracy and reliability when shooting. It's one of the best 3 gun scopes because it is perfect for shooting close- and mid-range targets. It is made of a durable aluminum alloy that is very lightweight, so it won't add a lot of weight to your rifle but will withstand anything you put it through. The performance of his scope is very accurate and precise. It doesn't do as well with long-range shooting but with 3 gun competitions the longest distance you'll have to deal with is 600 yards so this scope should work fine. Plus it's designed to help you get pinpoint accuracy and be able to shoot your target every time. It's also a very affordable scope, making it great for new or beginner 3 gun shooters. The only drawback is that it doesn't have a focal plane or illuminated reticle. All of Bushnell’s scopes come with a lifetime warranty as well. The Burris Fastfire is designed to help you shoot your target as efficiently and quickly as possible. It has 1x magnification so you don' have to worry about any distortion when shooting quickly at different distances. The illuminated reticle and bright red dot help you quickly find the center of your target so that you can point and shoot as soon as possible. When it comes to 3 gun competitions speed is very important, and that’s why this scope is a great choice. A drawback may be that it doesn’t have higher magnification to help you see targets that are farther away, but that may not be a big concern for all shooters. Burris offers a “forever warranty” with no questions asked, so you are guaranteed to get a great quality product. This scope from Barska is great for helping you shoot at long distances, with it 3-9x magnification and illuminated reticle. It also has a large eye box and eye relief so you can see your target quickly without having to perfectly line up your vision. Shooting at long-ranges will be ideal with this scope. You can easily bump up the magnification to as much as 9x, which is higher than other scopes. But it may make it harder for the close-range targets as you won’t have the 1x magnification option. It's also fog proof and waterproof so it's great to use in all weather conditions. Plus, at an affordable price, it's a good option for 3 gun competitions. Like most other scopes, it comes with a lifetime warranty. The Eotech scope offers a lot of great features at a mid-price range so you don't have compromise on quality for the price. It has true 1x magnification with zero distortion and has a revolutionary sighting system to help you close in on your target every time. Although it doesn't have high magnification, you may not need it for most 3 gun competitions. This model is also water resistant so you don’t have to worry about the elements. It also has unlimited eye relief and 20 different brightness settings to keep you shooting accurately and efficiently no matter what. Unlike other brands, this scope only has a 10-year warranty which could be a downside if that matters to you. This scope has a magnification of 2.5-10x, which gives you a large range and helps you shoot long distance targets with ease. It also features a laser that will reach up to 100 yards, an illuminates reticle and is made of durable aircraft aluminum. It's a great 3 gun scope because you can choose between red or green illumination, it delivers a clear and bright image, and it's specifically designed to help you shoot long distance targets accurately. The only drawback of this scope if that it has a short eye relief and it may not be ideal for close-range target, but overall it's a powerful scope that is very affordable. Although it’s affordable it comes with a limited warranty, which isn’t as valuable as other scopes. Nikon delivers a good quality scope with this model, which has 3-9x magnification to allow you to easily shoot targets at a range of distances. It has special design features that deliver a clear, bright image no matter what light conditions you’re shooting in. It zeros in on your target quickly, which is perfect for shooting efficiently in 3 gun competitions. Also, it's very lightweight and easy to install. This scope also comes with a lifetime warranty which makes it even better. The only downside is that the reticle isn't illuminated. It's important to remember that higher magnification power isn't always better. There are a lot of advantages to low power scopes. Low magnification may be all you need in 3 gun competitions and you don't have to worry about distortion or lack of clarity when zooming in on targets. You can do a low with a low powered scope and they may even help you switch between targets more efficiently. So the phrase bigger is better isn't always the case when it comes to magnification. 3 gun competitions are very fast-paced, which means there is a lot of excitement and action going on. You want to make sure that you get a scope that is going to easily go from one shooting scenario to another without causing you a lot of time switching from mode to mode. You need to be able to react quickly and shoot accurately, so be sure to pick a scope that will allow you to do that. There is a large range of scopes available for all kinds of shooting situations. And the price range between them is very large as well. You can find good scopes at affordable prices, less than a couple hundred dollars, or you can easily spend a couple of thousands of dollars on a scope. Take into consideration how often you'll be doing 3 gun competitions, how much shooting you do, and what your budget is for scopes when picking the right one. And remember, that you don't always have to pay the most to get great quality. New shooters to 3 gun competitions often ask what the maximum distance you could be shooting at in competition. Usually, the longest distance will be 500-600 yards. So as long as you have a scope that can allow you to shoot at that distance comfortably, then you should be fine. 3 gun competitions are all about performance so you obviously want to pick a scope that gives you high performance. But you also want to make sure that it has good usability as well. In a competition, you don't want to waste a lot of time adjusting your scope or fidgeting around with the settings before taking your shot. You need to easily and quickly go from one target to the next, so pick a scope that gives you that kind of performance. Hopefully, this article has given you an in-depth look at the different scopes available and which one is the best 3 gun scope. When it comes to competing in competitions, you need to look for more than just a good scope. There are a lot of specific factors to consider in 3 gun competitions that you do not normally think about. Specifically, you'll want a scope that can give you speed and accuracy in a range of different shooting scenarios. So you need to make sure to get a scope that is going to be able to handle all of that if you want to perform your best. Finding the best scope for your next 3 gun competition doesn’t have to be hard. Use this guide to find the scope that fits your specific wants and needs.